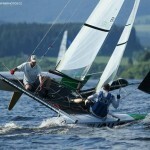 Two races were completed on the 1st day of the 2015 Tornado European Championships. 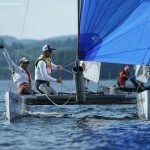 The weather was sunny in lake Lipno but the very shifty, gusty and light wind made the race demanding for the sailors. 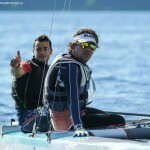 Greek Redbull team of Dany Paschalidis and Kostas Trigonis managed to stay in front in both races so they are leading with 2 points. Roland Gaebler and Nahid Gaebler ( J..J. Darboven team) from Germany are in the second place having equal points with the Hellenic Police team of Nikolaos Mavros and Alexandros Tagaropoulos. 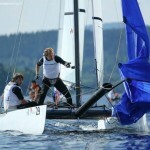 In the Mixed category Roland and Nahid Gaebler are on the first place. The second place goes to Dietmar and Silvia Salzmann from Austria who are followed by Piekavski Zbigniew and Gorska Ewa from Poland.